MANHATTAN, Kan.– Junior running back Alex Barnes found the end zone on four occasions, while the defense held Oklahoma State to the fewest points in the series since 2002, as Kansas State defeated Oklahoma State 31-12 in front of a Homecoming crowd of 50,245 at Bill Snyder Family Stadium on Saturday. Kansas State (3-4, 1-3 Big 12) has defeated Oklahoma State nine times in their last 11 tries, including consecutive wins over the Cowboys for the first time since the end of a nine-game winning streak in 2002. The Wildcats also have five victories in their last seven Homecoming appearances. The Wildcats were led by Barnes, who rushed for 181 yards and four touchdowns, behind a career-high 34 attempts. Barnes’ effort moved him into the top-10 in K-State history in rushing yards, while also surpassing the 2,000-yard plateau with 2,049 yards in his career. In addition, Barnes has rushed for 175 or more yards in two consecutive games, the most over a two-game span since Darren Sproles rushed for 273 against Missouri and 235 yards against Oklahoma in 2003. Oklahoma State (4-3, 1-3 Big 12) was held to 12 points, the lowest total in the series since 2002, when the Wildcats defeated the Cowboys 44-9. The Wildcat defense held Oklahoma State to 311 yards and 5-of-15 on third down, while also forcing two turnovers from senior defensive back Duke Shelley. 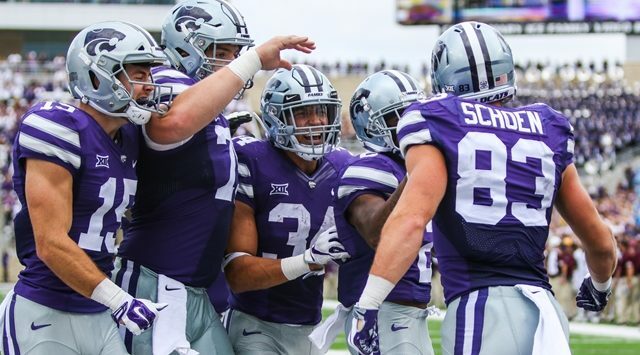 Following a 319-yard rushing performance a week ago against Baylor, K-State hit the ground running again on Saturday, accumulating 87 yards on the ground in the first quarter, including a 29-yard rush by Barnes. Despite the success on the ground, the Wildcats remained scoreless in the first quarter, while the Cowboys found points on a 48-yard field goal by place-kicker Matt Ammedola to make the score 3-0 at the end of the first quarter. Upon opening the second quarter, the Wildcats capped off a 13-play, 50-yard drive that resulted in a 31-yard field goal from redshirt freshman Andrew Hicks as the score was knotted at 3-3 with 13:32 left in the half. On the subsequent Oklahoma State possession, quarterback Taylor Cornelius dialed up a pass to wide receiver Tylan Wallace in the end-zone, in a pass that was bobbled and intercepted by Shelley, who tip-toed in the back of the end-zone to secure the interception. After a K-State punt, the Cowboys marched down the field and positioned themselves at the K-State 1-yard line, where redshirt freshman defensive end Wyatt Hubert stuffed the Oklahoma State shovel pass for a four-yard loss to force a fourth down. OSU converted on the field goal from 22-yards out, as Amendola connected on 2-of-2 field goals to give the Cowboys six points in the first half. K-State rushed for 122 yards in the first half, including 18 attempts for 89 yards from Barnes. On their last possession of the half, the Wildcats reached the red-zone, before time ran out in the half, as Oklahoma State led 6-3. The nine combined points in the half were the fewest in the series in any half since the second half of the 1992 matchup. After no touchdowns in the first half, K-State was able to strike on its opening possession of the second half, as the Wildcats drove 70 yards down the field, capped off by an 11-yard rush by Barnes. On the next possession, K-State went back to Barnes, where sophomore quarterback Skylar Thompson found Barnes on a wheel route for a 28-yard gain. The pass positioned the Wildcats in the red zone, as Barnes found the end zone from 1-yard out on a carry out of the Wildcat formation. K-State led 17-6 with 2:41 left in the third quarter. In the fourth quarter, the Cowboys fought back behind a 1-yard touchdown rush by Cornelius to bring the score to 17-12 with 14:23 remaining in the game after the failed 2-point conversion. K-State expanded its lead to 24-12 with another efficient drive in the fourth quarter, in which, the Wildcats drove down the field in 9 plays, spanning 75-yards and 4:42. Barnes found the end zone on his third touchdown of the game, this time from 8 yards out to put the score at 24-12 with 9:41 remaining. K-State put the game out of reach late in the fourth quarter, when Barnes found the end-zone for the fourth time of the afternoon, making the score 31-12. On Oklahoma State’s final possession, Shelley registered his second interception of the game to seal the ball game at 31-12. Alex Barnes – Junior Alex Barnes continued to make history on Saturday, moving into the top-10 in K-State history in rushing yards, while also surpassing the 2,000-yard plateau with 2,049 yards. Over the last three games, Barnes has found the end zone eight times, the most since Collin Klein scored nine touchdowns over a three-game stretch in 2012. Barnes’ 175+ yards in consecutive games is the first time since 2003, when Darren Sproles accomplished the feat by rushing for 273 yards against Missouri and 235 yards against Oklahoma. Dalton Risner– The senior offensive lineman started his 45thgame on Saturday, tied for the third most by a Wildcat offensive lineman since 1989. Duke Shelley – The Wildcat defensive back has forced interceptions in all three of his career starts against Oklahoma State, as the senior secured two interceptions to up his career total to eight.Shelley’s interceptions on Saturday up his total to three this season, as he came away with an interception against Baylor a week ago. Justin Hughes– Coming off of a career-high 11 tackles a week ago against Baylor, Hughes led the Wildcats in tackles on Saturday, registering eight total tackles, including seven solo tackles and one tackle for loss. 2002– Saturday’s victory gives the Wildcats consecutive victories over the Cowboys for the first time since 2002. Last season featured a shootout in Stillwater, as the Wildcats escaped with a 45-40 victory on November 18.